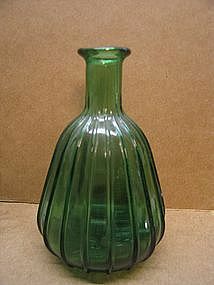 I always loved the unusual shape of this vase and the fact that the heavy base made it very stable. It is slightly over 6 inches in height. I am not sure of the manufacturer - there is some manufacturing information on the bottom, but it is so faint, as to be unreadable. It has a tiny shallow interior rim chip. I need your zip code to calculate the postage.